Building an entire home on long, thin stilts is a feat within itself, but how about balancing it on a single point? 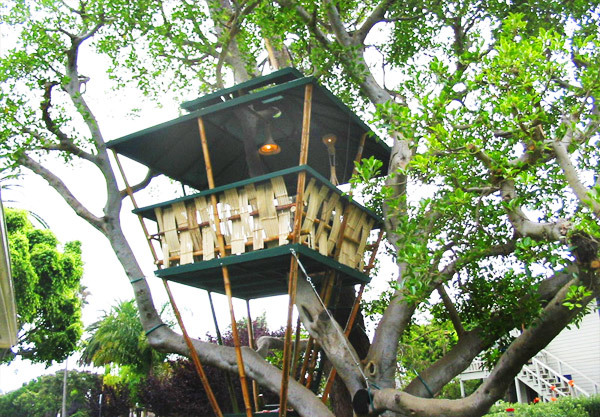 Well that's exactly what Jo Scheer does with every bamboo treehouse he lovingly builds. Dubbed "hooches," the lofty homes turn architectural conventions upside down and allow people to erect awesome tree homes without disrupting the surrounding areas due to their minimal foundations - the smallest of any land-based building in the world, according to Scheer. Building an entire home on long, thin stilts is a feat within itself, but how about balancing it on a single point? Well that’s exactly what Jo Scheer does with every bamboo treehouse he lovingly builds. Dubbed “hooches,” the lofty homes turn architectural conventions upside down and allow people to erect awesome tree homes without disrupting the surrounding areas due to their minimal foundations – the smallest of any land-based building in the world, according to Scheer. You might think that such an impressively non-invasive structure would be difficult to install, but according to Scheer, hooches are prefabricated to be easily and quickly set up amongst the trees. The main components are crafted from bamboo (a rapidly-renewable resource) and can be secured using a simple pulley system. And just like installation, breaking down the treehouse (though we’re not sure why you’d ever want to do that) is a cinch too. While it’s natural for humans to want to build homes amongst the beauty of nature, oftentimes the large footprint of these structures can destroy or disrupt the same plants and animals that we’re drawn to in the first place. Homes like the Sunset Hooch and the Luna Hooch protect the environment that they are built on and their tiny footprints ensure that they are more like respectful visitors, not destructive permanent residents. Hi Jo, it is wonderful to learn about Hooch structure which is suitable for my desire to build on tropical forest land without having to remove any beautiful trees. I am from Malaysia just acquired 3-acres land serves as our playground to live, learn & love. To learn how to build, could you provide information and advise. Please let me know the cost. With love from Malaysia, The McNABs. "The hooch is an ideal structure for a place of respite in an environmentally sensitive area," writes Scheer on his website. "I built a 10' by 10' version for a friend along a riverbank. The site did not lose one fern, a species abundant in the understory of the forest." You might think that such an impressively non-invasive structure would be difficult to install, but according to Scheer, hooches are prefabricated to be easily and quickly set up amongst the trees. The main components are crafted from bamboo (a rapidly-renewable resource) and can be secured using a simple pulley system. And just like installation, breaking down the treehouse (though we're not sure why you'd ever want to do that) is a cinch too. While there are several different hooches floating around, the ones pictured here are in Puerto Rico. Called the Sunset Hooch and the Luna Hooch, they're available for rental and the fees are only $125 and $100 per night, respectively. Plus, each hooch has a breathtaking view of nature and of the sunset. 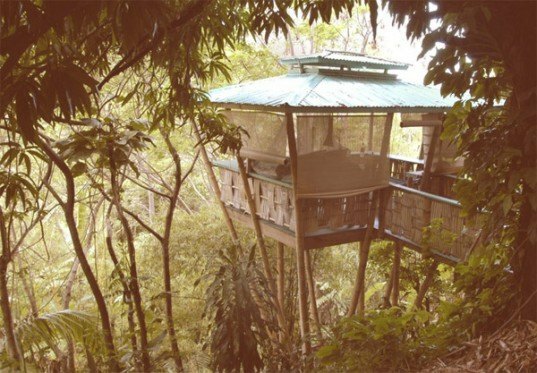 Each treetop home is totally self-sufficient with solar hot water, a shower, a kitchenette, a flush toilet, and there's even a "hot tub hooch." The stairs leading up to one hooch. WHY THIS MATTERS: While it's natural for humans to want to build homes amongst the beauty of nature, oftentimes the large footprint of these structures can destroy or disrupt the same plants and animals that we're drawn to in the first place. Homes like the Sunset Hooch and the Luna Hooch protect the environment that they are built on and their tiny footprints ensure that they are more like respectful visitors, not destructive permanent residents.